The CarTrawler global estimate forecasts 22% increase above 2016, with $57 billion of the total composed of a la carte fee activity. IdeaWorksCompany, the foremost consultancy on airline ancillary revenues, and CarTrawler, the leading provider of online car rental distribution systems, project airline ancillary revenue will reach $82.2 billion worldwide in 2017. The CarTrawler Worldwide Estimate of Ancillary Revenue represents a 264% increase from the 2010 figure of $22.6 billion, which was the first annual ancillary revenue estimate. Click here for an infographic summary (JPG file) of key findings. The 2017 merchandising report, released today by IdeaWorks and CarTrawler, describes how innovation in other industries, and within the travel business, can help airlines delight travelers and boost profits. The following are six examples from the report: Allegiant’s new Florida condo resort, Worldwide connections by easyJet, Delta’s baggage tracking app, Tui’s (Netherlands) mobile solution for buy on board, Jeju Air’s sleeping seat package, and the Clube Smiles subscription program by GOL. During August 2017, IdeaWorksCompany conducted 1,350 reward queries for key hotel brands in six global frequent guest programs: Best Western Rewards, Hilton Honors, IHG Rewards Club, Marriott Rewards, Starwood SPG, and Wyndham Rewards. For each query, the lowest reward price in points was recorded along with the corresponding room price in US dollars. The value provided by points was adjusted to consider the different rates of point accrual for the programs. Every year IdeaWorksCompany searches for disclosures of financial results which qualify as ancillary revenue for airlines all over the globe. Annual reports, investor presentations, financial press releases, and quotes attributed to senior executives all qualify as sources in the data collection process. These results are contained in the new report, 2016 Top 10 Airline Ancillary Revenue Rankings. Of the 138 airlines reviewed, 66 reveal figures related to ancillary revenue. Alaska Airlines has best reward payback among major North American carriers. The steady improvement in airline reward seat availability since 2010 ended with the results from this year’s CarTrawler Reward Seat Availability Survey. Last year 76.6% of reward queries provided access to a saver-style reward seat; this dropped to 72.4% for 2017. The story for US-based consumers is generally positive, while frequent flyer members elsewhere in the world are seeing moderate to significant declines in reward seat availability. This report assesses how frequent flyer programs have become very revenue aware in the distribution of miles, points, and rewards to their members. IdeaWorksCompany researched the accrual and reward methods of the world’s largest 25 airlines and their frequent flyer programs. The list has airlines from all over the globe, including alliance members, non-aligned airlines, and low cost carriers. IdeaWorksCompany finds Air France, Emirates, Indigo, and Ryanair provide great mobile retailing examples. The latest report from IdeaWorksCompany applies the rise of the mobile age to the ancillary revenue revolution. IdeaWorksCompany researched the in-path booking capabilities of the mobile applications offered by the world’s largest 25 airlines. It’s a varied list which includes traditional global network airlines and eight low cost carriers. This 15-page report is the first installment of the 2017 Thought Leadership Series on Revenue and Loyalty and is sponsored by CarTrawler. 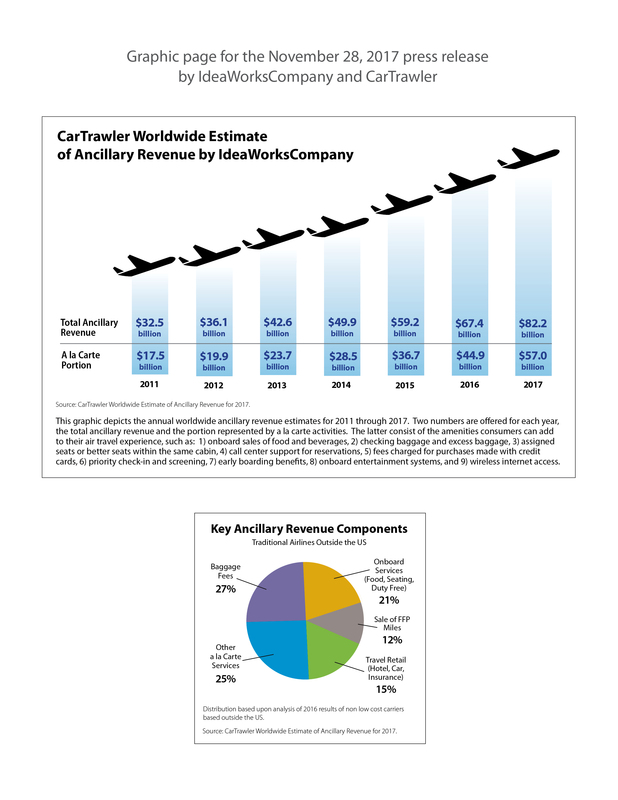 IdeaWorksCompany, the foremost consultancy on airline ancillary revenues, and CarTrawler, the leading provider of online car rental distribution systems, project airline ancillary revenue will reach $67.4 billion worldwide in 2016. The CarTrawler Worldwide Estimate of Ancillary Revenue represents a nearly 200% increase from the 2010 figure of $22.6 billion, which was the first year for the ancillary revenue estimate. The CarTrawler Worldwide Estimate of Ancillary Revenue marks the seventh year IdeaWorksCompany has prepared a projection of ancillary revenue activity. and other airlines are becoming better retailers. The latest report from IdeaWorksCompany provides a wide variety of examples − covering traditional airlines, low cost carriers, and suppliers from all over the world – to demonstrate unique methods that generate more revenue from the sale of tickets and ancillary revenue activities. IdeaWorksCompany releases results from the second annual Switchfly Hotel Reward Payback Survey, which now includes 6 global programs. During August 2016, IdeaWorksCompany conducted 1,305 reward queries for key hotel brands in six global frequent guest programs: Choice Privileges, Hilton HHonors, IHG Rewards, Marriott Rewards, Starwood SPG, and Wyndham Rewards. For example, Wyndham Rewards returns an average of 13.6% from room night spending as reward stay value. That’s a 143% higher return than the reward value provided by Starwood SPG, which was ranked last among the six hotel loyalty programs at 5.6% for reward payback.